Uncategorized Archives - A/C Covers, Inc. Your AC unit is probably the most expensive appliance you own for your home. So, it makes sense that should want to protect this investment. If you Google the question, “Should I cover my AC Unit,” you will see that there are many answers, most of which seem to conflict each other. Why? Doesn’t it seem like a simple answer – Yes or No. However, it is not as black and white, clear-cut as that. It depends greatly on factors such as quality, value, appearance and the most crucial factor – will by ac unit cover increase or decrease the life of the most expensive house appliance. In this article, I am focusing on winter air conditioner covers not summer air conditioner covers. Winter ac covers are meant to be used on ac units that are NOT in use. Quality: What type of material is the cover made from? How was in constructed (stitching strength and fit)? Will it blow off in a storm? Can it hold up to wind/sleet/snow/leaves/pine needles/(insert the name of weather challenges in your part of the country)? Will the sun discolor the material? Does the cover need to be held down with an additional facet? Air conditioner covers are sold in all materials from fabric to plastic to vinyl. The more expensive brands are made from fabric and vinyl. The little extra expense often means that it will also last longer, have UV protection and have stitching that will hold tight. Reliability: Many air conditioner covers must be secured with bungy cords so that the homeowner doesn’t have to worry about it blowing off in high winds or a storm. Let’s me honest with each other, this looks cheap. Why spend money on a cover that you have to add this not-so-pretty accessory and incur the expense of bungy cords. Also, if you use a bungy cord with metal ends, it can scratch the unit and cause accelerated rusting since the raw metal is now being exposed to the elements of nature. If your ac cover is for a second home that doesn’t get a lot of use in the winter, then the reliably of your cover being secured is a BIG factor. Value: Does it come with a warranty? How many years of life will I get out of it before having to purchase another cover? A cover should have at least a two-year warranty. This will give you confidence that your ac cover will last a few seasons. However, a high-quality cover will most likely last for 10 or more years. Appearance: Does it look like a glorified tarp? Does it add to the ascetics of my home or look like an eye-sore? If you put any money into landscaping and making your home look beautiful, then your outdoor accessories should match. There are covers that come in a variety of colors from blue to beige to green. Think – do I want my air conditioning cover to match the siding on my home OR do I want my air conditioning cover to match my landscape? Extend or Decease the Life of my Air Conditioner? Two, and only two, major factors should hold the greatest weight when considering all features. These are the two factors to AVOID – moisture and nesting critters. Moisture: Moisture (water) can freeze the air conditioner’s condenser coils, which can cause damage over time. Also, excessive moisture creates accelerated rusting of the coils and other components inside your ac unit. Most of the AC technicians who do not recommend covers state their concern for moisture building (condensation) as the main reason for not covering an ac unit. However, choosing an ac cover that allow for the proper amount of air flow to move through the unit instead of building up inside the unit is eliminates this concern. A cover that is just a few inches shorter than the ac unit is most ideal. The majority of the generic, one-size-fits all covers cover your entire air conditioner unit and therefore allows for this moisture build-up. It seems that covering your entire ac unit would be the best, but in fact, it is the worse thing you can do. Nesting Ground Critters: It is more likely that a small animal (mice and other critters) will nest in a ac unit that has a cover touching the ground. These small animals tend to chew on wires, which also decreases the life of your unit. Saving Money: Going back to my original point, your outdoor air conditioner is generally the most expensive appliance of your home. A quality cover, which allows for proper air flow, decreases the change of nesting animals, improves the appearance of your landscape and will be long lasting is worth a few extra dollars when choosing your ac cover. This is one of the products that is worth the extra expense now so that you get quality and don’t have to make a repeat purchase next year. We’re in the hottest part of the summer and your air conditioner is working overtime. The added stress of running your air conditioning all day takes a toll. Your AC system can freeze up, which definitely makes it inconvenient, hot in your house or business and may lead to costly, unplanned repairs. 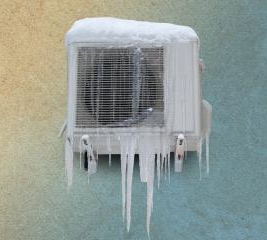 The good news is that there are plenty of ways to prevent a frozen air conditioner. Every year, schedule a routine inspection with your air conditioning repair team. During your evaluation, professionals check to make sure your HVAC system is free of leaks, damage or worn parts. Plus, your air conditioning company can refill the coolant at the same time. With the proper coolant levels, the odds of your unit freezing over are significantly decreased. In the past, I thought that spending money on a service contract was silly and a waste of money, but when it’s time for service or check-up, I find that with a contract I am first in line and if there are any issues, I am also on the VIP list. A key factor to a healthy HVAC system that never freezes up is proper air flow. Every season, swap out your air filters. This way, you can rest easy knowing you and your family are breathing perfectly filtered air and your unit isn’t at risk of freezing due to air flow issues. As a general rule of thumb, your air conditioning system should not be turned on if outdoor temperatures are 60 degrees or below. By opening windows, you’ll save money on energy bills and give your unit a much-needed break while staying comfortable. Easily enjoy a cool summer breeze and avoid an AC freeze at the same time. And, when your Air conditioner isn’t in use, such as the winter months, be sure to cover it with a properly fitting air conditioner cover that protects the unit, prevents condensation and keeps out the harsh weather, such as the covers created by AC Covers.